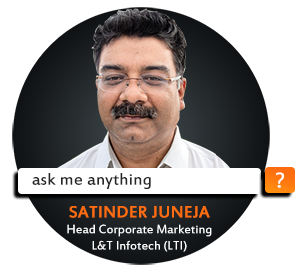 Satinder Juneja is a senior marketing professional with over 23 years of experience in B2B industries across IT & Telecom domains. He is Head-Marketing at L&T Infotech (LTI), responsible for Corporate Marketing function. Prior to that, he has worked for NIIT Technologies, Microsoft, Aricent, HCL Infosystems, AirTel, and The Hindustan Times in various roles in marketing. He also consulted with various IT/ITES companies and PR firms. He has touched all the facets of Marketing & Sales enablement thru his career. A TEDx speaker, he also featured on Gadget Guru on NDTV Profit. A speaker at Marketing conferences, he is part of the expert panels as well jury member at various marketing competitions. Satinder is also part of NASSCOM’s special interest group on Sales & Marketing. He has a passion to teach and is visiting faculty at several business management institutes for Digital, B2B & International Marketing. You can ask questions till 25th January and they will answered on 26th – 27th January. Please post your questions in the comment section below. Note: The questions have been answered by Ankush Garg, Marketing Director, Pentaur. Is Social Media A Waste of Time or still an opportunity if you strategize? How do you see the role of a marketer changing with the coming of automation and digital tech? How does a content marketer prepare for the future? a. A marketer’s role is constantly changing. Today’s marketing world requires constant learning and upgradation of skills. Automation and digital technologies augment the role and improve efficiency of digital marketing – both B2B and B2C. Automation helps reduce the time to do repetitive steps required for all campaigns. It makes you look at big picture and focus on the strategy and conversion at every stage of the funnel. It allows you to test and optimise (over time) all aspects of campaign. b. A content marketer should be able and willing to learn how to use automation and see how content – video, text, audio – in any form can be used for lead gen, brand awareness and advocacy. Where the content is posted, timing of content, topic and type of content, target audience, content value, content costs, etc are considerations for a content marketer. How will the landscape of Digital marketing change in the Year 2019? Digital marketing is constantly changing and will continue to do so. In both B2C/B2B marketing – Automation, AI, Social, local and mobile will continue to dominate discussion and implementation. The number of Mar-tech solutions will continue to increase and integration between components will become key. ROI of campaigns will determine how budgets are allocated. Digital marketing will continue to take budgets away from offline traditional channels. What should B2B companies do, to stay ahead of the marketing curve in the year 2019 & beyond? Digital marketing is constantly changing and will continue to do so. In B2B marketing – Automation, AI, Social, local and mobile will continue to dominate discussion and implementation. Marketing and Sales operations teams working closely with Marketing & Sales will become critical. Teams at various levels should be able and willing to learn and re-skill / retrain with changes every year. They should work with agencies & vendors – that have the experience and expertise and learn best practices from them. Using the latest bleeding edge technology / marketing stack has its risk and rewards. Evaluate and decide wisely. How do big B2B companies produce so much of content? How do you encourage leadership team to take part in writing content? a. Content can take many forms – short form text, long articles, short videos, audio clips, etc. Many big B2B companies have dedicated content teams that generate content weekly / monthly. Some companies even use “ghost” writers. But not all companies do – everyone and anyone can post content in various forms. Where the content is posted, timing of content, topic and type of content, target audience, content value, content costs, etc are determined by the company’s policies. b. The time of leadership teams or CxO is limited – hence outlining and defining exactly what is the message of the content is critical for them. Short form LinkedIn posts works well for company leaders. But Video generally works best for CxO. It can be 2-5 min, with subtitles and talking about company services / products. What are the marketing tactics we should use to get maximum ROI out of virtual events/webinars? A virtual event or webinar can be excellent way to generate leads & improve brand awareness. Before the event, generate awareness via FB/LI/TW, etc. to get more people to register. The topic and the speaker’s online brand and network can also help attract attendees. Send them email confirmation, reminders, etc. Depending on the topic, you can solicit questions and respond either in real time or after the event. Follow up with attendees by email / phone. An automation solution can help in planning and execution of all of the above activities. Since the cost of a webinar can be reasonably low, getting few high quality MQL/SQL leads to high ROI.